The Sword of God's Justice by C.F. Boerkoel, Sr.
“Awake, O sword, against my shepherd, and against the man that is my fellow, saith the Lord of hosts: smite the shepherd, and the sheep shall be scattered: and I will turn mine hand upon the little ones.” Zech. 13:7. We read in Romans 6:23 “For the wages of sin is death; but the gift of God is eternal life through Jesus Christ our Lord.” Sin is the cause of all ill, pains, sorrows, bereavements of our loved ones, and also the cause why so many hearts are broken in these days of great unrest. We declared war against God when we broke His Holy covenant, and little do we realize that this death which we already here experience is but the beginning of sorrows. We cry because of the results of sin, but not because of the cause of sin. The reason that we cry because of the results of sin, and not because of the cause of sin is: because in the breach with our Maker we became spiritually dead by nature, became totally impotent to return unto our Creator, having lost God’s image. But God who is rich in mercy has taken within Himself to restore His image again to His people in Christ Jesus who is the gift of God, and grants life eternal to such as deserve death. The flaming sword of which we read in Gen, 3:24 which turned every way, to keep the way of the tree of life, which justly could have consumed man, was to him for life eternal, for this flaming sword is removed by the promised seed. Gen. 3:15. (“For in the day that thou eatest thereof thou shalt surely die.” Gen. 2:17). he was sentenced to a three fold death, temporal, spiritual and eternal. He immediately died this spiritual death, a separation from his Creator, and became a law breaker. The Holiness and Majesty of God could not permit such transgressions to go unpunished, or He would cease to be God. His holy and glorious attributes had to be restored, and His holy law obeyed. The text speaks to us of the fathomless miracle of super-abounding sovereign grace; God the Father sending His own eternal Son into this sinful world, for the reconciliation of His bride chosen from the foundation of the world. The secrecy of the divine counsel is here revealed, namely, the riches of the wisdom and knowledge of God, the great enlightened apostle Paul expressed with astonishment the wonder of the plan of salvation with these words: ‘O the depth of the wisdom and knowledge of God: how unsearchable are His judgments, and His ways past finding out.” Rom. 11:33. Who shall express the excellency of the Mediator Christ Jesus, the express image of God, who counselled with the Father the redemption of His sheep, fallen from their estate of excellency into utter ruin in their covenant head Adam, breaking the covenant of works. All creatures in heaven and on earth together could not give the required ransom. Blessed is he who has come to the knowledge of his utterly lost state and condition, and his inability to restore himself into the favor of God by his own works or sacrifices. To attain the redemption of our soul we need a righteousness that can only be granted by Him, Who is not only very and righteous man, but who is more than man, namely, very God. Upon Him, and Him only was this sword of Justice laid: “Then said I, Lo, I come: in the volume of the book it is written of me, I delight to do Thy will, O my God: Yea, Thy law is within my heart.” Ps. 40:7, 8. Christ came into the world in the fulness of time (the new dispensation). He came into a state of subjection and to take upon Him the form of a servant; to redeem those that were under the law, that they might receive the adoption of sons. It was the appointed time of God the Father, the acceptable year of the Lord when Christ came into this world, that He exercised His justice with the sword of vengeance calling it to: “AWAKE AND SMITE MY SHEPHERD”. It was a judicial act under the sentence of the law that demanded His death. “And if a man have committed a sin worthy of death, and he be put to death, and thou hang him on a tree: His body shall not remain all night upon the tree, but thou shalt in any wise bury him that day; (for he that is hanged is accursed of God)”. Deut. 21:22, 23. Christ voluntarily made His soul an offering for the offenders (His sheep): “It pleased the Lord to bruise Him, and put Him to grief, and He was stricken, smitten of God and afflicted.” Isa. 53:4-10. God called Him, “He is my fellow”: for He thought it no robbery to be equal with God. He and the Father are one. And as God’s Shepherd, He is that good shepherd who gave His life for the sheep. But His own received Him not, and thrust Him through as a foolish shepherd. Christ was smitten the moment He came into the state of His deep humiliation. God became man, and there was no room for Him in the inn. His life was threatened by King Herod, and He had to flee into Egypt. He was smitten by Satan the tempter, but said, “Thou shalt not tempt the Lord thy God.” He was smitten by the religious leaders of His day, when they charged Him, that He had a devil. He was smitten by one of His own disciples, Judas Iscariot, who also betrayed Him. He was smitten with soul’s agony, being in Gethsemane as He fell on His face, and prayed saying: “O my father if it be possible, let this cup pass from me: nevertheless not as I will, but as thou wilt.” He was smitten as He stood before the Sanhedrin, mocked and buffeted, and with a platted crown of thorns upon His head. He was smitten by His own people when they rejected Him before Pilate the governor, as they cried: “His blood be on us, and on our children.” He was smitten and scourged. He was smitten when they cried: “He saved others; Himself He cannot save.” He was smitten when one of the soldiers pierced His side. If you seek me, let these go their way.” And fulfills His promise, and I will turn mine hand upon the little ones. Words fail to describe the sorrow of the Surety and that for a rebellious people whom He has loved even unto death. In His resurrection His promise was further fulfilled assuring the safety of His own, guiding His hands upon them, when He first appeared unto Mary Magdalene, and Joanna, and Mary the mother of James. He had also not forgotten His servant Peter, who had denied Him, His love had not diminished to him or to the other disciples. He visited the travelers to Emmaus and will be mindful of all the mourners who mourn for Him. They are the little ones unto whom He has promised that He would manifest Himself to them. “For the mountains shall depart, and the hills be removed; but my kindness shall not depart from thee, neither shall the covenant of my peace be removed, saith the Lord that hath mercy on thee.” Isa. 54:10. Christ never appeared unto the world after His resurrection, and never prays for them. “I pray not for the world, but for them which thou hast given me; for they are thine.” John 17:9. They are His peculiar people, His sheep, and His eye is ever upon them, He leadeth them in the green pasture of His word, and has promised that His spirit would lead them in all truth. “But when the Comforter, which is the Holy Ghost, whom the Father will send in my name, He shall teach you all things, and bring all things to your remembrance, whatsoever I have said unto you!” John 14:26. 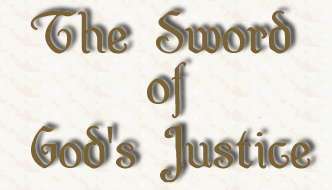 Dear reader, you have read a short narration of the sword of God’s justice exercised upon His shepherd. Was your heart touched at all as you read the recorded affliction laid upon Christ? Or is your heart like unto Gallio who cared for none of those things. Shall it be well for eternity we must have an experimental knowledge that the sword of God’s justice which effected the death of Christ was the cause of Adam’s transgression and for those comprehended in the second Adam (Christ). It should cause us a vehement godly sorrow that we have smitten the Lord with our sin. If we remain strangers to this work of grace, the sword of God’s justice will certainly be exercised upon us, and that through all eternity. Remember that the heart is deceitful, it can betray with a kiss as well as with a tear. Esau lifted up his voice and wept. He wept only because of the results of sin, not because of the cause of sin. Fear hypocritical mourning, it is like unto the Pharisees, who have a form of Godliness but deny the power thereof. Who can adequately extol the praise of such a Savior?